Mobility Parking Permit: Apply Online! 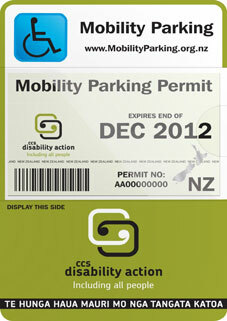 The mobility parking permit scheme makes getting around local communities a bit easier for more than 100,000 New Zealanders! You can learn more about the scheme and download an application form here! Your application will be processed within five working days of your appliacation and payment being received, and you’ll be sent your permit, or you can collect it at your local CCS Disability Action branch. Long-term mobility parking permits need to be renewed every five years. You’ll be sent a reminder four weeks before the permit expires, so you need to notify CCS Disability Action if your address changes. You can provide address change details online too! Those who don’t have a mobility parking permit may be fined $150 if they park in a mobility parking space or try to use concessions in standard parks without displaying a valid permit. The link above will also connect you to information about your responsibilities as a mobility parking permit holder, and what you can use the permit for.